The all-new Katowice 2019 Viewer Pass is now available for purchase in-game and from the Steam Community Market. With a Viewer Pass, you'll get an upgradable Katowice 2019 Event Coin, access to the Katowice Pick'Em Challenge, Team Graffiti, Steam.tv flair, and exclusive access to Katowice 2019 Souvenir Packages! 50% of the proceeds go to the players and organizations taking part in the IEM Katowice Major. Activate your Katowice 2019 Viewer Pass and you'll get a Bronze Katowice 2019 Event Coin that you can upgrade by watching matches and playing the Katowice Pick'Em Challenge. Complete challenges to upgrade your coin from Bronze to Silver, Gold, or Diamond! Even better, every time you upgrade your coin, you can redeem a Souvenir Package from the match of your choice. Your coin will upgrade when you've completed five (Silver), seven (Gold), or all eleven (Diamond) challenges. Want a souvenir from your favorite match? Every time you upgrade your Event Coin you can redeem a Souvenir Package from the completed match of your choice. Souvenirs will feature one of the MVPs from that match, so watch the Major and make your choice! When you activate your Katowice 2019 Viewer Pass, you'll get exclusive access to Steam.tv team flairs that you can display next to your name while you watch the live tournament matches on Steam.tv For the duration of the Major, you'll also get unlimited access to graffiti for each of the 24 teams and the event organizer. Team and Autograph stickers from your favorite pro players are now available for purchase in-game and from the Steam Community Market. 50% of the proceeds go to the players and organizations taking part in the IEM Katowice Major. Place team stickers on your weapons to show your support! 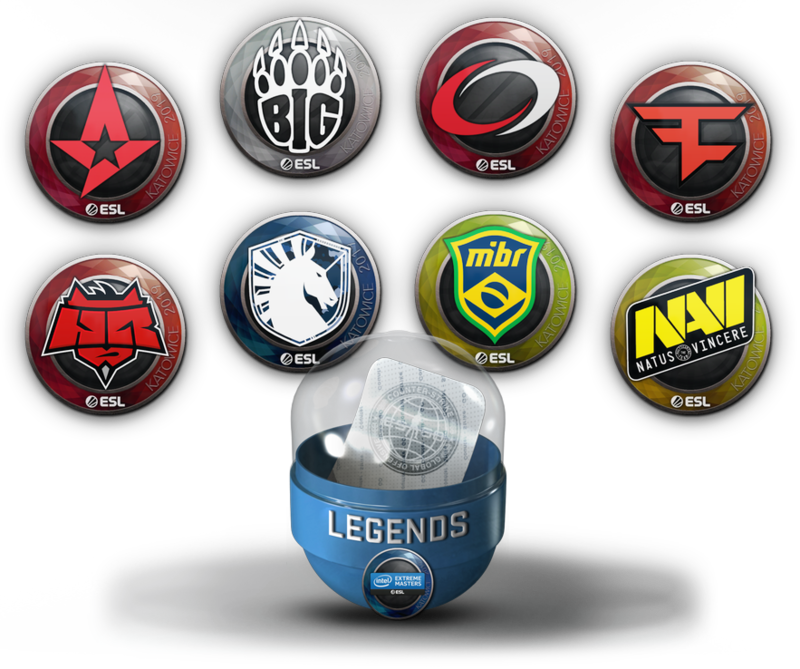 You can purchase your favorite team stickers directly, or collect Holo or Foil stickers by purchasing team sticker capsules featuring the Legends, Returning Challengers, or Minor Challengers. Support your favorite CS:GO players by collecting their paper, foil, and gold autograph stickers! Start your collection by purchasing Legends, Returning Challengers, or Minor Challengers Autograph Capsules in-game or from the Steam Community Market. Activate your Katowice 2019 Viewer Pass to get access to the updated Pick'Em Challenge, where you'll have access to all 24 teams. 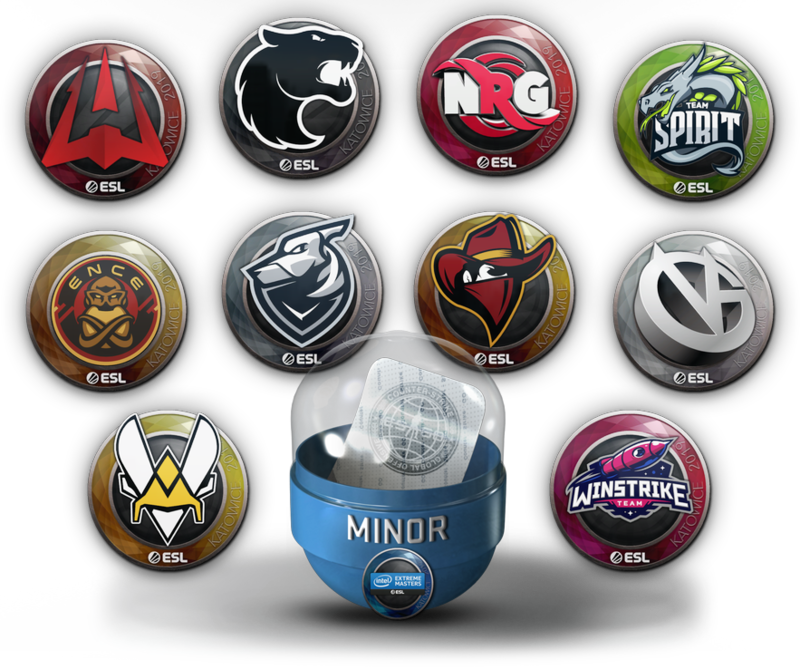 Predict which teams will advance (or not) from each stage in Katowice to complete challenges and make progress toward upgrading your Katowice Event Coin. Each stage features a challenge with its own bar for success, so pay close attention to the teams and pick wisely! Picks are locked as soon as a stage begins, so make sure you submit your first set of predictions before the Challengers Stage begins on February 13th. Make a second set of predictions before the Legends Stage begins on February 20th, and a third set of predictions before the Champions Stage begins on February 28th. How do I upgrade my Katowice 2019 Event Coin? 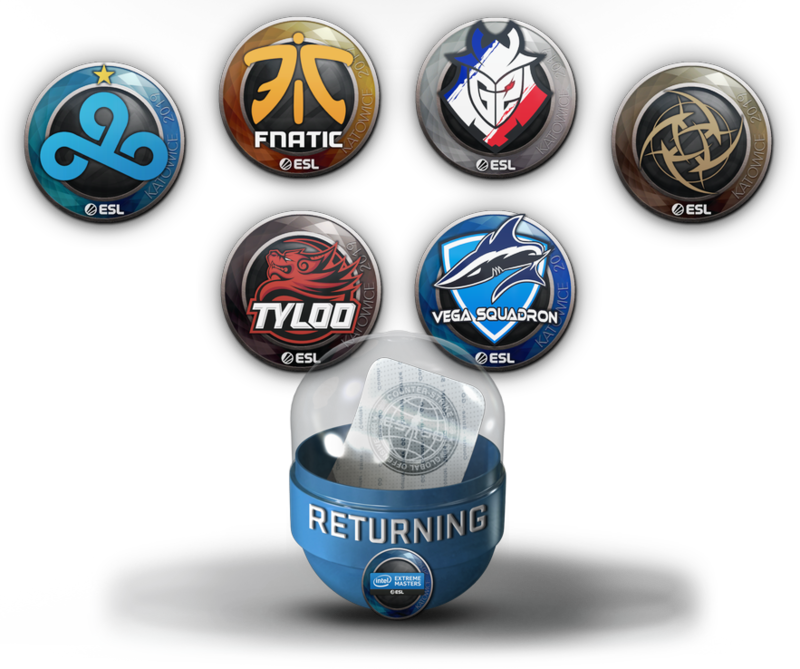 You can upgrade your event coin by activating your pass, completing Pick'Em challenges, and by watching live matches throughout the Major. Complete five challenges to upgrade your coin from Bronze to Silver. Complete seven challenges to upgrade your coin from Silver to Gold. If you complete all eleven challenges, you'll upgrade your coin to Diamond! Each time you upgrade your coin, you can redeem a Souvenir Package. How many Souvenir Packages can I earn with the Katowice 2019 Viewer Pass? You can redeem up to three Souvenir Packages, one each time your Katowice 2019 Event Coin is upgraded. You can redeem your Souvenir Packages immediately for any completed match, or hold on to them and make your decision later, until March 31st. How much time do I have to redeem Souvenir Packages? Souvenir Packages can be redeemed until March 31st. How do I participate in the Pick'Em Challenge? The Pick'Em Challenge is part of the Katowice 2019 Viewer Pass and unlocks after your Viewer Pass has been purchased. How do I complete challenges in the Pick'Em game? To complete challenges in the Pick'Em game and earn progress toward upgrading your coin, you'll have to make a certain number of correct picks for each stage. In the Challengers and Legends stages, you'll have to pick five out of the nine results correctly. You can complete up to three challenges for the Champions stage: set up your bracket and correctly pick at least two of the winning Quarterfinalists, at least one winning Semi-Finalist, and the winner of the Grand Final. Can I submit picks for the Pick'Em Challenge after a stage has begun? No. After a stage has begun picks can no longer be made for that stage. The Challenger's Stage begins February 13th, the Legends Stage begins February 20th, and the Champions Stage begins February 28th. Get your picks in early! Can I activate more than one Katowice 2019 Viewer Pass? No. You can only activate one Katowice 2019 Viewer Pass on your CS:GO account.